Blomkamp will start untucking that blanket tomorrow when the trailer for Elysium debuts online, and it’ll give audiences a taste of the bracing, brawny, brainy movie that today’s footage seemed to showcase: an action film with a whole lot on its mind, similar to Blomkamp’s feature debut, the Best Picture nominee District 9, but realized on an even bigger scale. The director describes Elysium (out August 9) as “a science-fiction take on the haves and have-nots and the separation of wealth,” and Matt Damon stars as one of those have-nots, a former car thief living in a slummy future Earth studded with smoking skyscrapers while the pristine space station Elysium looms up above, a beautiful paradise for rich one-percenters that’s patrolled by a severely ponytailed Jodie Foster. 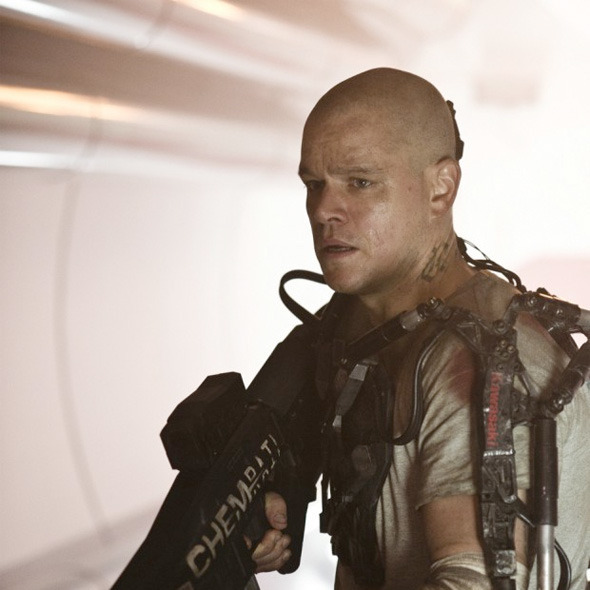 After a factory accident leaves Damon so irradiated that he’ll only live five more days, he realizes that the sole cure to his condition can be found on the technologically advanced Elysium. With the help of characters played by Wagner Moura and Diego Luna, then, Damon is grafted into a brawny mech suit resembling Sigourney Weaver’s power loader from Aliens (which Blomkamp cited as “my favorite movie of all time”) so that he can kidnap rich businessman William Fichtner, steal his identity, and hijack his way to Elysium.